59% of all people say they rarely do this in the car, 40% of all people say they have never done this in a car; what is it? 59% of all people say they rarely honk their car horn at another vehicle, 40% of all people say they’ve never honked their horn at another vehicle. Only 1% of all drivers admit to commonly honking their horn at other drivers. 20% of all people say they have one that is broken with no intention of fixing it; what is it? 20% of all people say they have a broken back door doorbell and have no intention on fixing it! Congratulations to Eric Jones of Hagerstown, IN for being the first to correctly answer the Impossible Question! The more money you make the less likely you are to do this; what is it? The more money you make the less likely you are to eat hot dogs. Congratulations to James Martin of Hagerstown, IN for being the first to correctly answer the Impossible Question! Even though this is most commonly done at home, 85% of all women admit they also like to do this when away from home; what is it? Aside from doing this daily at home, 85% of all women admit that they also commonly brush their teeth away from home! Congratulations to Judy Retz of Winchester for being the first to correctly answer the Impossible Question! 40% of all office workers admit they do not know how to do this; what is it? 40% of all office workers admit they do not know how to change their computer password and would need help to do so. Congratulations to Cheryl Elgin of Centerville, OH for being the first to correctly answer the Impossible Question! Men are three times more likely than women to say no to this food; what is it? Men are three times more likely than women to say no to leftovers! Congratulations to Lewis Fussner of Richmond for being the first to correctly answer the Impossible Question! 19% of all kids admit that they do this before school; what is it? 19% of all kids admit that they make their bed before going to school! Congratulations to Casey Spurrier of New Paris, OH for being the first to correctly answer the Impossible Question! Even though it could get them into trouble, 70% of all men admit they have done this; where is it? Even though it could get them into trouble, 70% of all men admit they they spray painted, egged or TP’d property when they were younger. Congratulations to Reny Keener of Winchester, IN for being the first to correctly answer the Impossible Question! When alone for the first time in a new boyfriend’s house, 8% of all women admit they’ve looked here; where is it? When alone for the first time in a new boyfriend’s house, 8% of all women admit that they’ve looked through pockets of pants and jackets in his closet! Congratulations to Kelli Slavey of New Castle, IN for being the first to correctly answer the Impossible Question! 54% of all women admit to fantasizing at least once a month about this; what is it? 54% of all women admit to fantasizing at least once a month about quitting their job! Congratulations to Ricky Long of Centerville, IN for being the first to correctly answer the Impossible Question! In the past three years, there has been a 20% increase in the number of adults participating in this; what is it? In the past three years there has been a 20% increase in the number of adults playing dodgeball competitively! Congratulations to Dustin Davis of New Castle, IN for being the first to correctly answer the Impossible Question! The average family has eight of these in their home; what are they? The average family has eight coffee mugs in their home. Congratulations to Corey Brannon of Richmond for being the first to correctly answer the Impossible Question! 7% of all people who have one of these say it makes their job difficult; what is it? 7% of all people that have a phobia say it makes their job difficult! Congratulations to Amanda Creech of Brownsville, IN for being the first to answer the Impossible Question correctly! 8% of all people say this bores them the most; what is it? 8% of all people say listening to people talk about their children bores them the most! Congratulations to Angie Leverton of Connersville, IN for being the first to answer the Impossible Question correctly! 12% of singles are turned off by this on an online dating profile; what is it? 12% of singles are turned off by a someone wearing glasses in their online dating profile. Congratulations to Katie Solomlon of Lynn, IN for being the first to answer the Impossible Question correctly! Only 13% of all people believe that this is OK to do on a flight; what is it? Only 13% of all people believe that it is OK to take your socks off on a flight. Congratulations to Alex DiGenova of Centerville, IN for being the first to answer the Impossible Question correctly! 66% of all people say doing this makes them feel better when they are down; what is it? 66% of all people say eating pizza makes them feel better when they are feeling down! 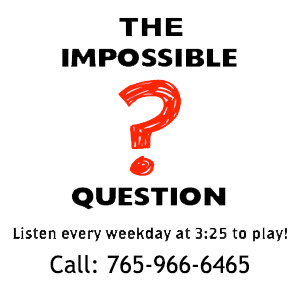 Congratulations to Rachel Shelley of Connersville for being the first to answer the Impossible Question correctly!